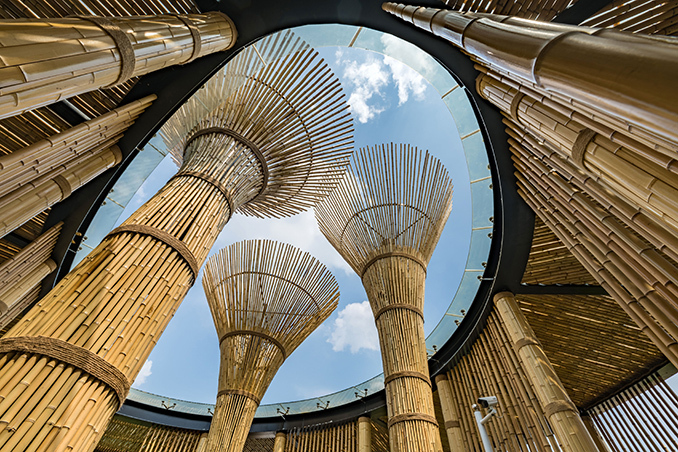 The connotative relationship between architecture and nature as well as architecture and culture always attracts the attention of the architects as a key focus. 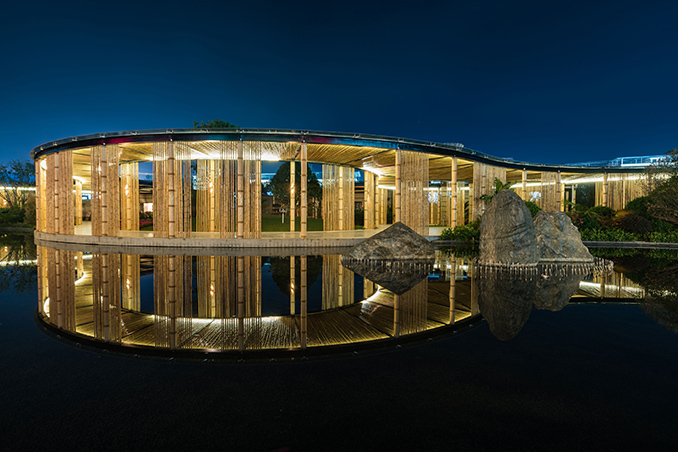 In this project, we hope to establish a linkage between architecture and nature as well as architecture and culture in a simple and plain way. Just as art and literature both have sketches, this project is a construction sketch to some extent. It doesn’t mean that the sketch has neither technical difficulty nor thought depth. Instead, it just doesn’t need to spare no pains and give mature consideration to all aspects of a question. Sketch is a flash in high spirits, which means without too much hesitation when selecting from big things through small ones. 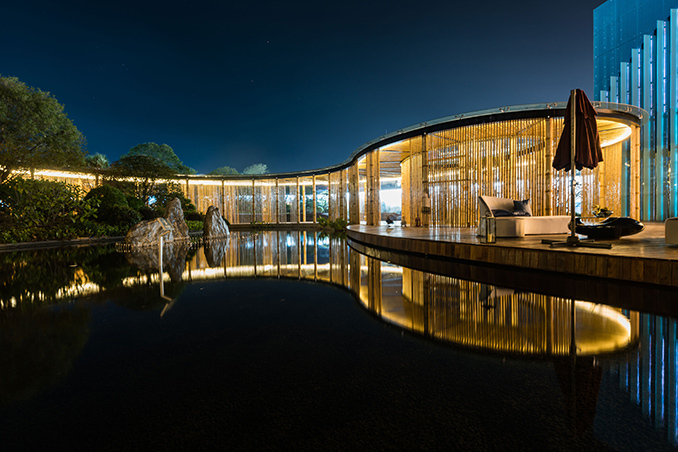 From landscape to architecture, we hope this house can express the scenery and breath of nature in an implicit way, which is complex but temperate, free but rhythmic. 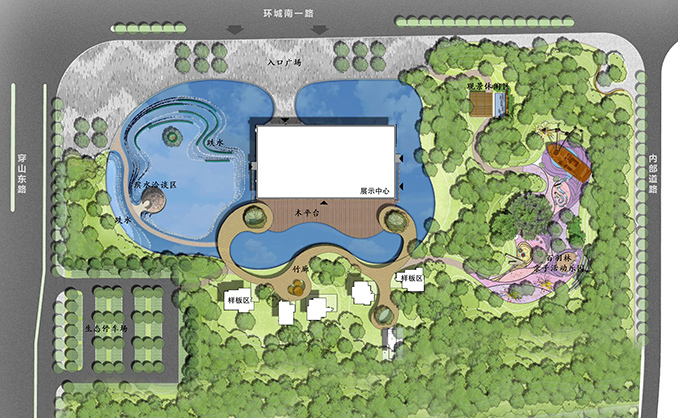 Thus, human, nature, architecture and scenery are connected together. “ShanShui” has special significance in the traditional Chinese culture. For example, traditional Chinese paintings are divided into figure paintings, bird-and-flower paintings and mountains-and-waters paintings. In traditional Chinese paintings, landscape painting is called mountains-and-waters painting, while in classical Chinese poems and lyrics, landscape poem takes a crucial splendid part. Dating back to Wei and Jin dynasties, landscape paintings entered a period of great prosperity in Tang and Song dynasties, which integrate universe, nature, humanity and art together in an abstract and enjoyable manner, thus forming unfailing interest. Chinese literators abandon themselves to mountains and water, express their aspirations to mountain and pour out their feelings to water. There are not only natural scenery in landscape poems, but also view, emotion and feeling, which manifest the symbiotic relationship between human beings and nature with the union of mind as well as the interlink of breath. The scenery of Guilin has been called the finest under heaven. There, typical karst topography constitutes peculiar scenery, and mountains rise out of the ground in different poses with different expressions; in the Lijiang River, twisting water is bright and clean as a mirror; besides, there are also many caves in the mountains with fantastic rock peaks, forming “Four Wonders of Guilin”——green mountains, clean water, strange caves and beautiful stones. 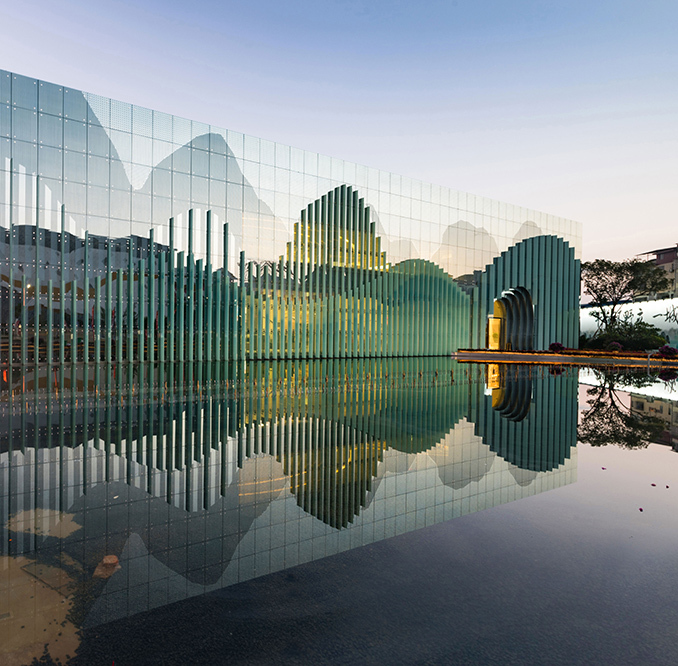 Thus, it is a natural selection to create a landscape theme for a display architecture located in Guilin, such a poetic city surrounded by mountains and water. We try to exclude “patterning” from this aesthetical landscape to some extent and make it shown by a kind of abstract line structure. The architecture in the plan is still a very simple cube without any shape or style change, which creates a “landscape cube” through the curtain wall structure. 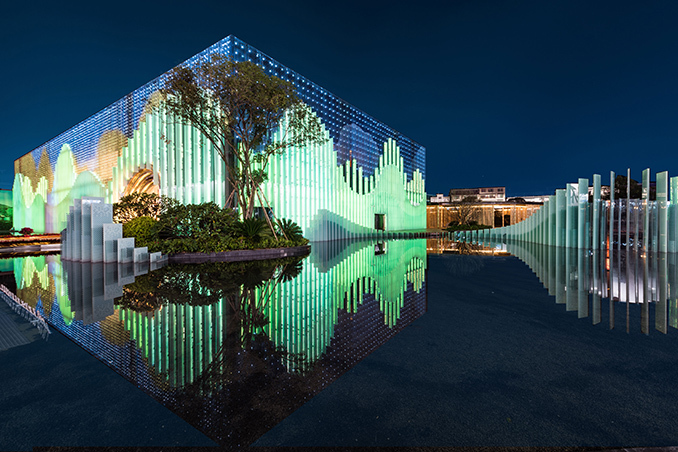 We hope the project can be derived from the scene, to form, through a pure glass box evoke people’s inner feeling about nature and landscape Sentiment. Compared with those projects with huge volume and complicated functions, this exhibition center is an undeniable architectural sketch. During the creating process, we want to make it simple and relaxing. We give more consideration to the pureness of concept and operability of implementation. At that time, what we considered is mainly shown as follows: 1. From shape to connotation: How to manifest the connotation of “landscape” in the traditional Chinese culture by simple architectural language? 2. 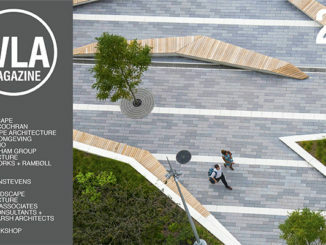 The depth of space in external surface construction: How to express the stratification of landscape and depth of space by the surface treatment? 3. 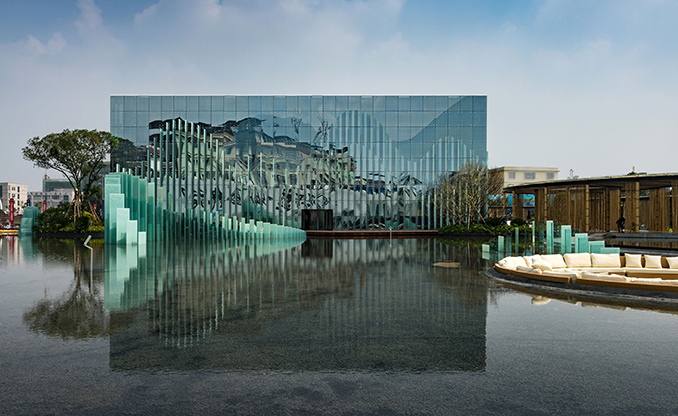 Scenery direction of the material composition: How to build an implicit object with fuzzy boundary and overlapped layer using different reflection, refraction and transmission performances of glass together with the digital-colored glaze glass in order to create an enshrouding natural landscape? In a word, the whole design starts from construction and context. Mountains in Guilin are well-distributed far and near. 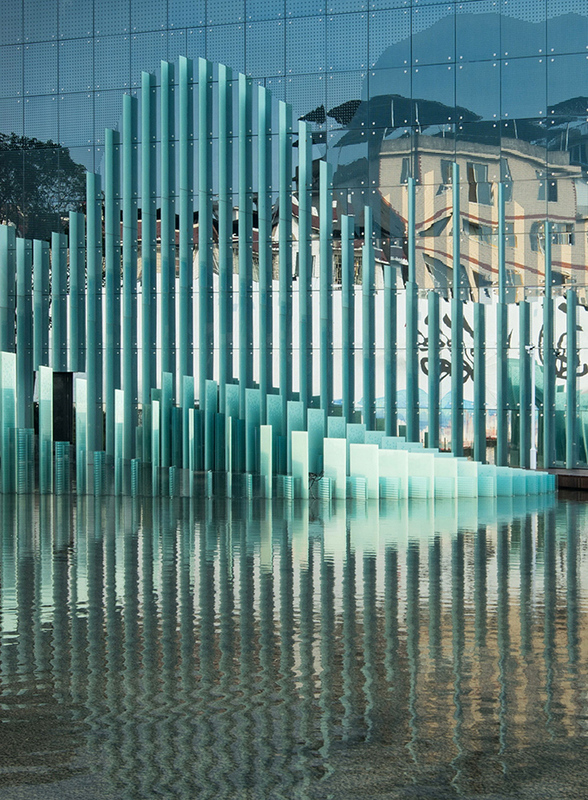 In addition to the inverted reflections on the water, a rich gradation is formed accordingly. 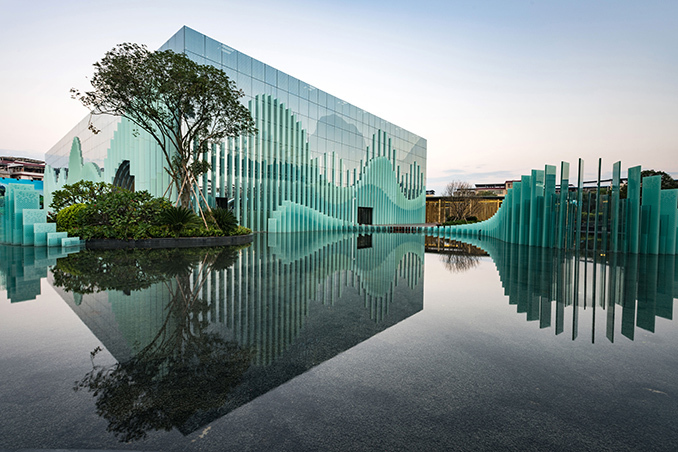 This architecture manifests the hillshapes up and down through the rising and falling vertical glass ribs and creates three hillshape levels of the facade through different densities and overhang scales of glass ribs, namely “nearby view”, “medium view” and “distant view”. Thus, the gradation superposition caused by the transmission, reflection and refraction effect between different glass can form subtly changeable dramatic effect under different light conditions such as cloudy, sunny, raining and foggy. In the mottled shadows, the “boundary” becomes blurry and flowing. 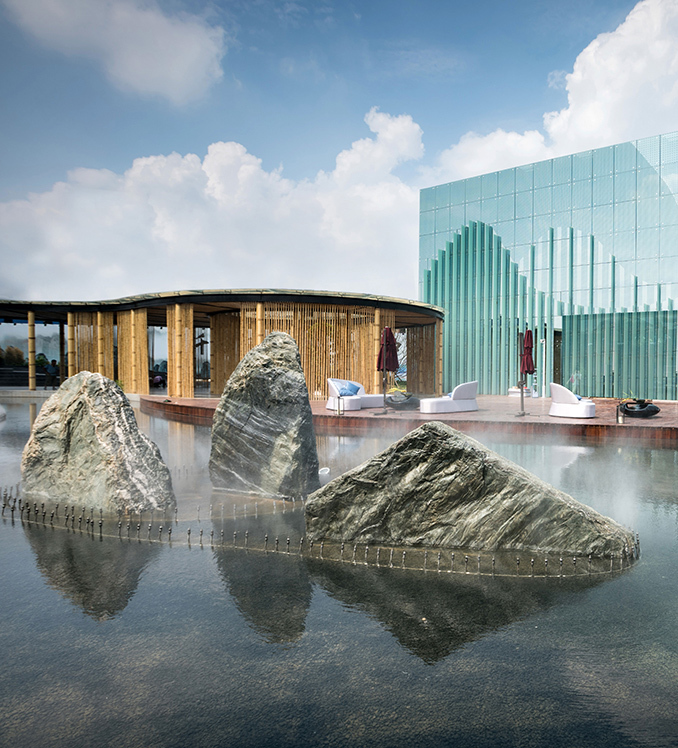 At a close look at the architecture, people feel like staying in the mountain range while steam flows above, and the architecture reflects the changes of the surrounding natural environment sensitively. 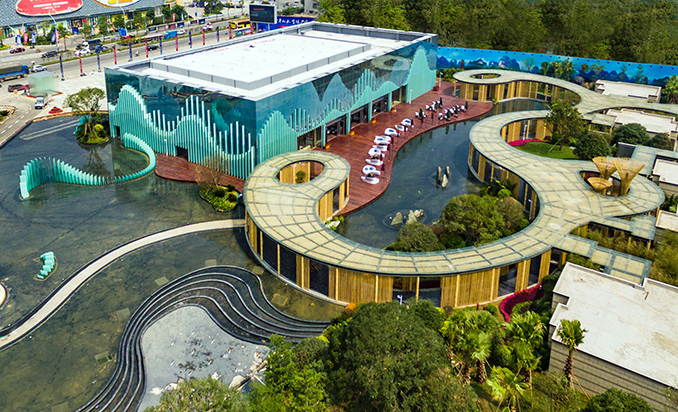 Viewers, architecture and landscape of Guilin interact with each other, creating a wonderful and far-reaching prospect. 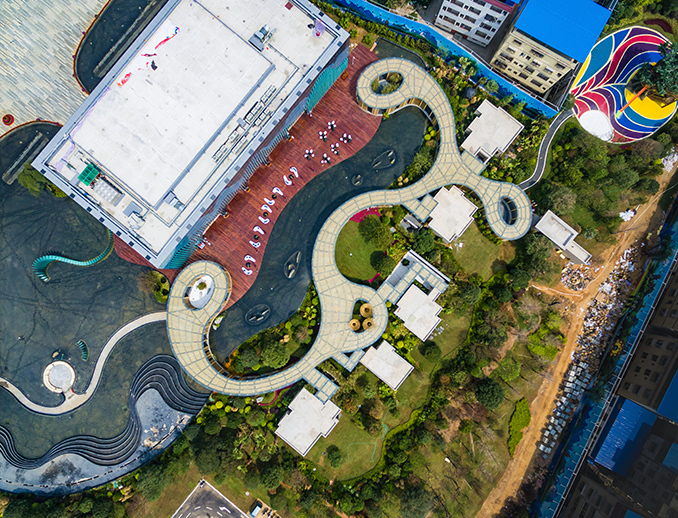 The landscape design of the Exhibition Center continues the theme of landscape and realizes the linkage and scaling of space by virtue of layered water surface, winding path and elegant bamboo gallery, which forms a delightful contrast and makes people stroll in it. As people move their steps, they will see different sceneries and go into a wonderful paradise from landscape. Main contractor | Uashi Decoration Co. Ltd. Selected subcontractors | SBG South Bright Glass Co. Ltd.